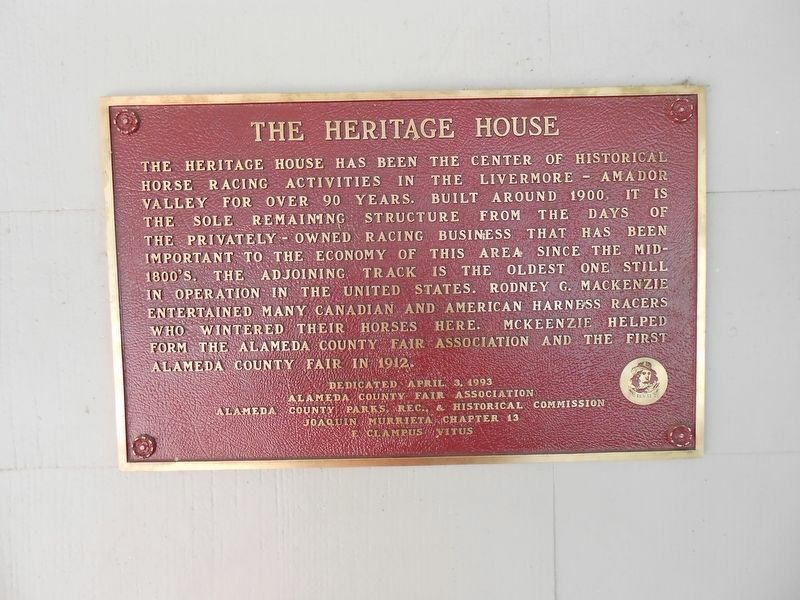 The Heritage House has been the center of historical horse racing activities in the Livermore – Amador Valley for over 90 years. 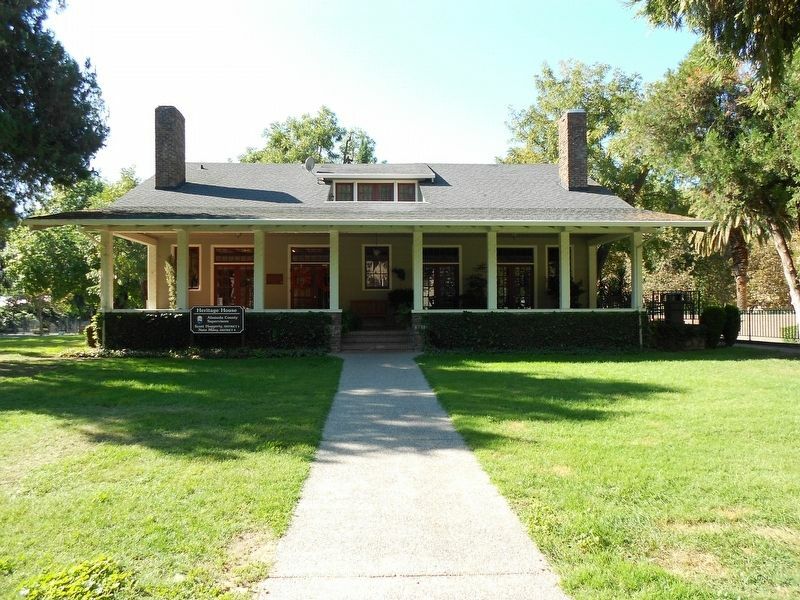 Built around 1900, it is the sole remaining structure from the days of the privately-owned racing business that has been important to the economy of this area since the mid-1800’s. The adjoining track is the oldest one still in operation in the United States. Rodney G. Mackenzie entertained many Canadian and American harness racers who wintered their horses here. McKeenzie helped form the Alameda County Fair Association and the first Alameda County Fair in 1912. Erected 1993 by The Alameda County Fair Association Alameda County Parks, Rec., & Historical Commission Joaquin Murrieta Chapter 13 E Clampus Vitus. 53.095′ W. Marker is in Pleasanton, California, in Alameda County. Marker is on Fairgrounds Road. Touch for map. The address given is of the Alameda County Fairgrounds. The marker can be seen on the Heritage House Building at the fairgrounds off of Fairgrounds Road. Marker is at or near this postal address: 4501 Pleasanton Avenue, Pleasanton, California 945, Pleasanton CA 94566, United States of America. Touch for directions. Other nearby markers. At least 8 other markers are within 2 miles of this marker, measured as the crow flies. Rancho El Valle de San Jose (about 300 feet away, measured in a direct line); Gay 90's Pizzeria (approx. half a mile away); The Pleasanton Hotel (approx. 0.7 miles away); J. W. Kottinger’s Barn (approx. 0.7 miles away); Kottinger’s Barn (approx. 0.7 miles away); Alviso Adobe Community Park (approx. 1½ miles away); Francisco Solano Alviso Adobe (approx. 1½ miles away); Alviso Adobe (approx. 1½ miles away). Touch for a list and map of all markers in Pleasanton. More. Search the internet for The Heritage House. Credits. This page was last revised on January 22, 2018. This page originally submitted on January 15, 2018, by Frank Gunshow Sanchez of Hollister, California. This page has been viewed 79 times since then and 6 times this year. Photos: 1, 2. submitted on January 15, 2018. • Andrew Ruppenstein was the editor who published this page.